Suicide bombers blew up cars packed with explosives outside two police stations north of Baghdad Saturday, killing at least 18 people in the latest deadly strikes on Iraq's U.S.-backed police force. In Baghdad, a civilian plane operated by global cargo company DHL made an emergency landing after one of its engines caught fire. Airport officials said the plane may have been hit by a missile and the U.S. Army said it was investigating. In the town of Khan Bani Saad, a car sped toward a police station and detonated as Iraqi police opened fire on it, U.S. soldiers at the scene said. Captain Ryan McCormack said six police and three civilians were killed. Another suicide bomber targeted the main police headquarters in the nearby town of Baquba, 40 miles north of Baghdad. Lieutenant Colonel William MacDonald, spokesman for the U.S. 4th Infantry Division, said seven policemen and two civilians were killed in Baquba. The death tolls excluded the car bombers and some witnesses said the Baquba attacker was wearing a police uniform as he drove toward the building. "I was standing on the balcony of the police station as the car was coming toward the building," said policeman Nazaar Hamzan. "He was wearing a uniform like mine." Dead and wounded from both attacks were brought to Baquba's hospital, where blood was congealed on the floor of the wards. "I was trying to resuscitate a four-year-old girl whose legs were blown off but she didn't make it," Dr Sharif Saleh said. A huge crater was blown into the road outside the Baquba police headquarters. Nearby, a packet of cigarettes lay in a pool of blood, close to a shoe torn apart by the blast. One policeman said he found a severed hand 500 yards away. Shards of glass were strewn inside the police station. Part of an air-conditioning unit had been blown across one room, with a police armband stuck to it. Drops of blood could be seen. "We were in front of the police station and we heard a huge explosion," said school principal Jamal Numaan, who witnessed the blast. "Blood came out of my ears and nose." 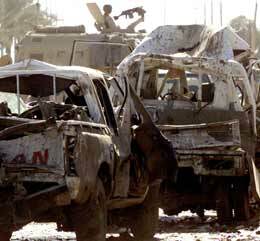 Suicide attackers have struck several times at Iraqi police. On October 27, coordinated car bomb attacks on three Baghdad police stations and the International Committee of the Red Cross killed at least 35 people. Earlier that month, two suicide bombers killed eight Iraqis at another Baghdad police station. At Baghdad international airport, officials said initial reports suggested the DHL plane had been hit by a missile. DHL officials said the Airbus A300 had taken off from Baghdad airport and returned to make an emergency landing after an engine fire which was being investigated. No one was hurt. Guerrillas have attempted several times to hit planes near Baghdad's airport, but until Saturday no fixed-wing aircraft had been reported hit. Helicopters have been much more vulnerable targets -- over the past month, guerrilla attacks have brought down five, killing 49 soldiers. The United States blames diehard Saddam Hussein loyalists and foreign Muslim militants for attacks on U.S. troops, foreign organizations and Iraqis cooperating with occupying forces. Since Washington declared major combat over on May 1, 182 U.S. soldiers have been killed in action in Iraq. American commanders say guerrillas are becoming increasingly inventive and attacks are showing signs of greater coordination. Friday, guerrillas used donkey carts to launch Katyusha rockets at Iraq's Oil Ministry building and two fortified hotels used by Western contractors and journalists. A third cart loaded with 21 rockets was stopped by U.S. troops near the Italian and Turkish embassies and close to the offices of one of Iraq's Kurdish parties. A fourth cart -- with the donkey wired up with explosives -- was found and defused. Abdul Aziz Al-Hakim, a member of Iraq's U.S.-appointed Governing Council and head of the Supreme Council for the Islamic Revolution in Iraq (SCIRI), a leading Shi'ite party, was also targeted in a rocket attack Friday, his son said. "It was a terrorist attack on his life by remnants of Saddam's regime," Mohsen al-Hakim told Reuters in Tehran. He said a rocket was fired from a nearby garden as his father was in a mosque but failed to explode. Facing a mounting death toll in Iraq, the United States has unveiled a faster timetable for handing over power to Iraqis. A sovereign Iraqi government is due to be in place by the end of June next year, with elections to follow by the end of 2005. But The New York Times quoted U.S. Army officials on Saturday as saying Washington plans to keep 100,000 troops in Iraq through early 2006.